Hey there; I’m back. This review is cross-posted from Neko Machi, a weird little webcomic I do in collaboration with the very talented C. Ellis. Since Neko Machi is about a bunch of catgirls, I’ve started doing a series of posts reviewing other works featuring them. Shoko Iwami’s Suzinari! 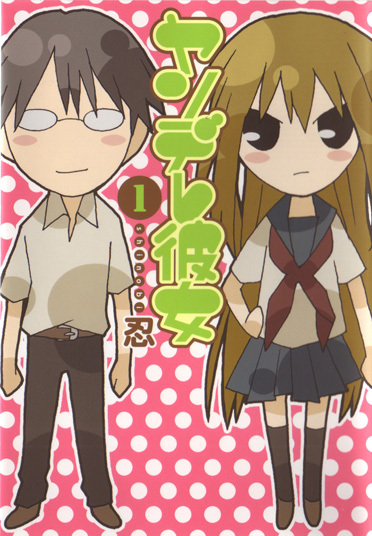 is yet another of the 4-panel manga that Yen Press licensed from Houbunsha. With a catgirl right on the cover I couldn’t very well not pick it up, could I? It has two volumes total, and it winds up being short but sweet. This is the first of a series of manga reviews by yours truly. I’ll be concentrating on off-the-wall stuff that I happen to like, and largely avoiding the really popular stuff that other people have already covered extensively elsewhere. I mostly buy my manga in the original Japanese (at the local Kinokuniya), and many of the titles I’ll be reviewing–including this first one–aren’t yet available in English. Yandere Kanojo is a gag manga with a very direct, straightforward style. It stars Reina Ryuuzaki and Manabu Tanaka. Reina is the leader of the female delinquents in her school, and Tanaka is a diligent but otherwise unremarkable student. “Yandere” normally refers to a girl who’s sick and twisted (from yanderu/病んでる) but has a flustered, lovestruck, sweet side (deredere/デレデレ). It’s a scarier variant of the tsundere thing that’s become so trendy. Yandere Kanojo doesn’t have a yandere character; instead, the “yan” in the title comes from Yankii (a female delinquent). Reina is this peculiar kind of “yandere,” a mean girl who can kick the crap out of anyone who crosses her path, but can be embarrassed and downright sweet when it comes to Tanaka. My name is Ewen Cluney. (“Ewen” is pronounced like “Aaron” for reasons my parents have never adequately explained to me.) I’m a translator, gamer, and all-around anime fan and geek. When I decided I wanted to write reviews of the strange manga I’ve been reading, Guy and I agreed that Geekorner was a better fit than any of my own blogs, plus I already have too many of those. I’ll be posting up my first manga review pretty soon, but I wanted to start of with a self-introduction and a post about something hardly anyone else really knows about. Hello gang, Guy here. Ewen will post on this blog now and then (basically when he feels like it, up to an entry a week – the first manga review is already written and waiting for publication!). Ewen and I go back several years, and what he doesn’t tell you is that he translates from Japanese to English, including having translated the Maid RPG, and official anime episodes. Ewen’s posts will also be posted under the “Ewen’s Corner” category. Treat him well! My vices are frequently anime-related in general, though I don’t own too many figures on account of the ones I already have take up too much space. (Though I do have the sukimizu/nekomimi Nono Nekomiya figure.) Instead I’ve made commissioning art of my mascot character (or OC if you prefer), Kurumi, into a comparable financial sinkhole. I periodically commission artwork online (mainly through DeviantArt), and I usually take reference pictures of her with me to any convention I attend where there are lots of artists. (This year I got four at WonderCon and five at FanimeCon.) It’s probably kind of creepy to some people, but apart from its effect on my bank account I’m quite unrepentant about it. This time around I want to write a bit about the custom plushies I’ve gotten. 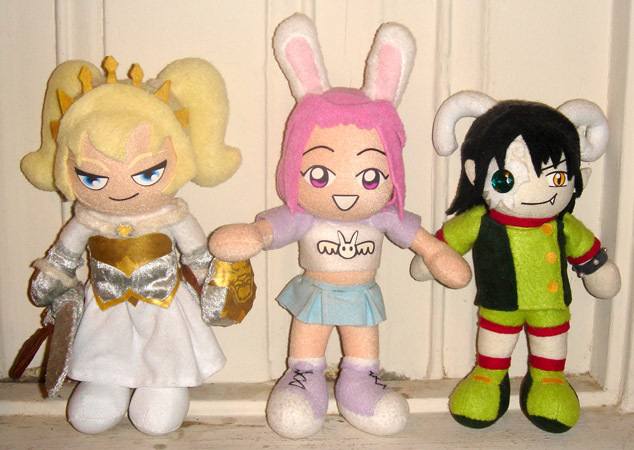 Left to right, Octavia, Kurumi, and Maya, all by Squisherific.